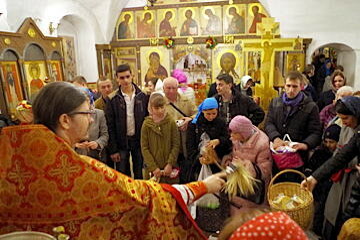 Beween 8 and 19 April, Brother Alois and four other brothers spent time visiting Russia, Belarus and Ukraine. Here are a few echoes from the pilgrimage in Moscow shared with a hundred young people from all over Europe and further afield. We will shortly be publishing further reflections on the time the brothers spent in Minsk and the pilgrimage to Kiev and Lviv, with testimonies from some of the young participants. "Young people from Russia, Belarus and Ukraine, belonging to various churches, are here with us. Together with them we know that Christ is our hope and our peace. With a few of the brothers and with young people from different European countries, we will go on a pilgrimage to celebrate Christ’s resurrection with them during the Orthodox Easter celebrations on 12 April." There was a lot of work to do, but these few months have been the happiest of my life in Moscow. It made sense to be there in this great, busy city. It gave me a deep feeling of happiness to prepare this meeting with other people, that I got to know during this time of Lent already turned towards the light of Easter. The trust that the brothers showed us also touched me a lot. I am also very grateful to have been able to put into practice in my own country, my own city, my own parish what I have experienced here as a volunteer in Taizé. Going out to meet people, inviting them to welcome pilgrims in their homes, all this is a bit unfamiliar to us. The volunteers, the host families and the parishioners who just came to give a hand, we really were like "salt for the earth." 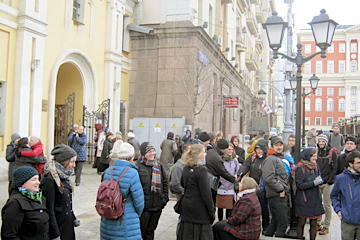 At the invitation of the Russian Orthodox Church the brothers and young people were welcomed in five parishes in Moscow. There they took part in the various church services, including the Office of the Twelve Gospels on Thursday evening, and the Service of Burial of the Shroud on Friday afternoon. On Saturday morning, after the Eucharist, Metropolitan Hilarion, head of external relations for the Patriarchate of Moscow, greeted the young people and the brothers on the square in front of the church. There were also visits to important sites. On Thursday the pilgrims went to the Vysoko Petrovskiy monastery and the Russian Orthodox University of St. John the Theologian. 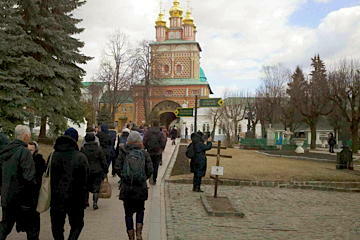 On the morning of Good Friday they went by train to visit the famous Trinity Lavra of St. Sergius monastery at Sergiyev Posad. The same day there was a stop at the village of Semkhoz, where Father Alexander Men was assassinated 25 years ago. On Saturday, after visits to different witnesses of the Resurrection in different places in Moscow, the brothers and the young people took part in the Pascal Liturgy. For many of the young people the most striking part of their stay was the hospitality of the families, as evidenced by what they wrote afterwards. After taking part in Sunday celebrations with the Catholics or the Lutherans, everybody met up again for a meeting with Sergei Chapnin, editor of the Moscow Patriarchate Journal. The brothers and the young participants then went together to the Cathedral of Christ the Saviour for the Easter vespers presided by Patriarch Kirill, who Brother Alois had had the opportunity to greet the previous evening. Coming to Moscow for the first time four years ago and discovering the Russian Orthodox Church was an incredible experience in my spiritual life. Although I could not understand the complexity of the liturgy, the language or the richness of the religious rituals and traditions, my heart was touched by the atmosphere in the Orthodox liturgy, which, in my eyes, represents the pure mystery that is faith. I have never before felt such a profound joy about the resurrection of our Lord. Being in Moscow again for the last couple of days was like coming back to this source of deep and serious joy, which I can take back with me to my own country, my daily life and my own church. Because it is a wonderful and mysterious feeling that goes deeper than the differences between our churches. For that I am very grateful to all who were involved in making this meeting possible and I hope there will be ways in the future to continue this pilgrimage. 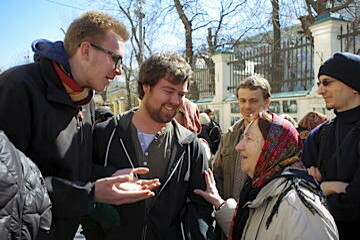 One of the things that touched me the most in Moscow was the hospitality of the local Christians. We were welcomed so warmly and the locals seemed to be so sincerely happy to meet with us that it gave me a feeling of unity. The most important thing was that we were all Christians! Everyone was treated equally, no matter from which church we came from. It was wonderful to be able to take part in the life of an Orthodox community, see them rejoicing in the resurrection of Christ. Moscow is always Moscow, with those anonymous grey buildings and those people with colourful hearts. Colours of happiness and joy because Christ is risen. This has been the Orthodox Easter to me: a tsunami of joy that filled my heart! Living Easter in Moscow brings you back to what is really essential. The discovery of a different Christian tradition forces you to remember that liturgy speaks first to your heart. Orthodox songs and prayers, in an unknown language, can touch your heart in an indescribable way. On Saturday night, the Easter liturgy gathered us together in a very joyful and beautiful prayer. It reminded me how much the differences among Christians fade away before that common cry of "Christ is risen, He is risen indeed!" During this Holy Week I witnessed the joyful and deep faith of the Orthodox Church. This witness help me believe more strongly in ecumenism and christians living together in harmony. The joy of the Gospel and of our Lord’s resurrection is shared in every corner of the world and celebrated with the same enthusiasm by all peoples. Christ is risen and he has again renewed this promise. “I wish that you experience Russia in all its variety during your stay here”, said Abbot Pyotr Yeremeyev of Vysoko-Petrovskiy Monastery during the meeting we had with him at the Orthodox Theological University. He was right, we had a very wide-ranging program in Moscow - from a 700 year old monastery to a big Easter party after the Liturgy of the resurrection. Through this different way of meditating, through the many candles and the illuminated iconostasis, I had a deeply beautiful experience. The Orthodox services were a real discovery for me in many ways: the beauty of the liturgy with its different sacred symbols; the harmony of the different voices in the choir added to the prayerful atmosphere ; and of the cours the length of the services. For the future, I think this meeting will give me new encouragement to pray for the unity of Christians. Finally, the celebration of Holy Week and Easter touched the hearts of everyone. Prayer was the centre of our pilgrimage. We attended the beautiful services every morning and evening, beginning with the celebration of the last supper and ending with the Resurrection of our Saviour. Saints on the walls, warm colours, the smell of incense and angelic voices welcomed us into the Russian Orthodox churches. This was a new reality of a Church where people live their faith with passion and devotion, following strongly their traditions and sharing with each other the love of Christ. I was touched to see the Church so alive, where the Resurrection is lived in all its fullness. After more than four hours of Liturgy and prayers, the people share the blessed meal inside the church, transforming Easter Day into a real celebration.